This is a scalable context timeline. It contains events related to the event October 30, 2010: California’s Pro-Oil Proposition 23 Supported Primarily by Large Oil Interests, Proposition Defeated. You can narrow or broaden the context of this timeline by adjusting the zoom level. The lower the scale, the more relevant the items on average will be, while the higher the scale, the less relevant the items, on average, will be. The advocacy wing of the Americans for Prosperity (AFP) Foundation, founded by right-wing billionaire David Koch in 2004 (see Late 2004 and August 30, 2010), holds a weekend summit called “Texas Defending the American Dream” in Austin, Texas. 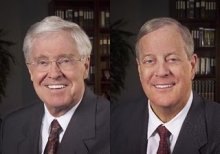 Charles and David Koch. [Source: PRWatch (.org)]The New Yorker publishes a lengthy analysis of the Koch (pronounced “coke”) financial empire, and its long-time financial support for right-wing causes (see 1981-2010). The article, written by investigative reporter Jane Mayer, shows that Koch Industries, led by brothers David and Charles Koch, has donated over $250 million to Republican and conservative politicians and organizations since the mid-1990s. The Koch brothers are also well-known philanthropists, having given millions to New York City’s Metropolitan Opera, $100 million to the Lincoln Center’s New York State Theatre building, $40 million to the Sloan-Kettering Cancer Center, $20 million to the American Museum of Natural History, and $10 million to the Metropolitan Museum of Art. Second-Largest Private Industry in US - Koch Industries, a $100 billion conglomerate, garners most of its profits from oil refineries and associated interests; it owns the firms that manufacture Brawny paper towels, Dixie cups, Georgia-Pacific lumber and paper products, Stainmaster carpet, and Lycra fabric. Koch Industries is the second largest private company in the US after Cargill, and taken together, the Koch brothers’ fortune of some $35 billion places them just behind Microsoft’s Bill Gates and Wall Street financier Warren Buffett as the nation’s richest people. Longtime Libertarians - Personally, the Koch brothers espouse a libertarian philosophy—drastic reductions in corporate and personal taxes, huge cuts in government expenditures on social services, and widespread deregulation of industry, particularly environmental. Koch Industries was recently listed in the top 10 of US air polluters, and has for years funded organizations that oppose climate change, giving even more than ExxonMobil to organizations, foundations, and think tanks that work to derail or overturn climate change legislation. Koch funds so many different organizations that oppose various initiatives of the Obama administration that Washington insiders call the Koch ideological network the “Kochtopus.” While the Koch brothers have protested being characterized as major supporters of the right-wing agenda—David Koch has complained that the “radical press” is intent on making him and his brother into “whipping boys”—Charles Lewis, the founder of the Center for Public Integrity, says: “The Kochs are on a whole different level. There’s no one else who has spent this much money. The sheer dimension of it is what sets them apart. They have a pattern of lawbreaking, political manipulation, and obfuscation. I’ve been in Washington since Watergate, and I’ve never seen anything like it. They are the Standard Oil of our times.” The Kochs have embraced the pure free-market ideology of economist Friedrich von Hayek, who argued that any form of centralized government would lead to totalitarianism and that only complete, unregulated capitalism could ensure freedom. Many “tea party” supporters, such as Fox News host Glenn Beck, have openly embraced von Hayek’s ideals. Inculcated Ideals of Anti-Communist Father - Both brothers are steeped in the anti-Communist, anti-government, minority-disparaging views of their father, Koch Industries co-founder Fred Koch (see 1940 and After). Using the 'Tea Parties' - Conservative economist Bruce Bartlett, who has worked at a Koch-funded think tank, says that the Kochs are playing on the anti-government fervor of the “tea parties” to further their pro-business, libertarian agenda. “The problem with the whole libertarian movement is that it’s been all chiefs and no Indians,” Bartlett says. “There haven’t been any actual people, like voters, who give a crap about it. So the problem for the Kochs has been trying to create a movement.” With the emergence of the “tea parties,” Bartlett says, “everyone suddenly sees that for the first time there are Indians out there—people who can provide real ideological power. [The Kochs are] trying to shape and control and channel the populist uprising into their own policies.” A Republican campaign consultant who has worked for the Kochs says of the tea party movement: “The Koch brothers gave the money that founded it. It’s like they put the seeds in the ground. Then the rainstorm comes, and the frogs come out of the mud—and they’re our candidates!” The consultant says that the Kochs keep an extremely low profile, in part to avoid accusations that they are funding an “astroturf” movement (see April 15, 2009). A former Koch adviser says: “They’re smart. This right-wing, redneck stuff works for them. They see this as a way to get things done without getting dirty themselves.” Democratic political strategist Rob Stein, who has studied the conservative movement’s finances, says the Kochs are “at the epicenter of the anti-Obama movement. But it’s not just about Obama. They would have done the same to Hillary Clinton. They did the same with Bill Clinton. They are out to destroy progressivism.” Since a 2009 rally attended by David Koch (see November 2009), the brothers have all but explicitly endorsed the tea party movement, with David Koch praising it for demonstrating the “powerful visceral hostility in the body politic against the massive increase in government power, the massive efforts to socialize this country.” Echoing the sentiments of many tea party leaders, Charles Koch said in a newsletter sent out to Koch Industry employees that President Obama is comparable to Venezuelan strongman Hugo Chavez. Strategy - Charles Koch told a reporter that “[t]o bring about social change” requires “a strategy” that is “vertically and horizontally integrated,” spanning “from idea creation to policy development to education to grassroots organizations to lobbying to litigation to political action.… We have a radical philosophy.” The Kochs launched their first “think tank,” the libertarian Cato Institute, in 1977 (see 1977-Present), which has been effective in promoting corporate tax cuts, deregulation, cuts in social spending, and in opposing governmental initiatives to combat climate change. Other Koch-funded institutes such as the Heritage Foundation and the Independent Women’s Forum have also publicly opposed efforts to combat climate change. History professor Naomi Oreskes, the author of a book, Merchants of Doubt, that chronicles attempts by American industries to manipulate public opinion on science, says that the Kochs have a vested interest in keeping the government from addressing climate change. “If the answer is to phase out fossil fuels,” she says, “a different group of people are going to be making money, so we shouldn’t be surprised that they’re fighting tooth and nail.” David Koch has said that though he doesn’t believe that any global warming effects have been caused by human activities, if indeed the globe is warming, it will benefit society by lengthening growing seasons in the Northern Hemisphere. Several years after founding Cato, the Kochs provided millions in funding to the Mercatus Center at George Mason University in Arlington, Virginia, which Stein describes as “ground zero for deregulation policy in Washington.” Mercatus is headed by Richard Fink, a Koch Industries lobbyist and president of several Koch-funded foundations. Mayer describes Fink as the chief political lieutenant of the Koch brothers. Mercatus was quite successful at having the Bush administration adopt a number of its deregulatory strategies, particularly environmental deregulation. Like Cato, critics of Mercatus accuse it of serving the brothers’ corporate needs while hiding behind the facade of a nonpartisan academic organization. “Ideas don’t happen on their own,” says Matt Kibbe, the president of FreedomWorks, a tea party advocacy group heavily funded by the Kochs (see April 14, 2009). “Throughout history, ideas need patrons.” FreedomWorks is one of many citizen activism groups founded and/or funded by the Kochs, usually masquerading as “grassroots” organizations started by “ordinary citizens” (see 1984 and After, 1997, and Late 2004).